Phyllis Guenthner Ethridge was a high school athlete in Boston, Massachusetts, where she excelled in swimming, diving, volleyball and basketball. She also played junior and senior high school softball for St. Theresa’s CYO team in the Boston City League (1946-51). She was selected to the All-Star Team all six years and her team won the City Championship in 1948. In 1952, Phyllis relocated to Tucson to attend St. Mary’s School of Nursing. She established the St. Mary’s Bells and was a player/coach in the Tucson City Softball League at Santa Rita Park. In 1954, she played in the city and state tournaments for Flowing Wells that was coached by A.C. Williams. She won the batting champion trophy and was selected All-Star catcher. Phyllis pursued her nursing career as an orthopedic staff nurse, head nurse and Vice-President for Carondelet St. Mary’s Hospital. She also played softball from 1955-65 for the L&L Drive-In Rancherettes, 1966-72 for the Tucson Roadrunners, and 1973-74 for the Old Timers. She was chosen All-Star catcher 1954-67 and All-Star first baseman in 1966, ’67 &’68. Her team was state champions for five years in a row and participated in three world tournaments. Phyllis, who earned a BSN and Master’s in Nursing from the UA, married and had six children. As her own youngsters began to participate in sports, she volunteered as a coach and manager for the Tucson Mountain Little League and umpire for the 15-17 year old boys’ basketball league. She also assisted with the Elks Swim Team for ten years and is a life member of the Salpointe Booster Club. 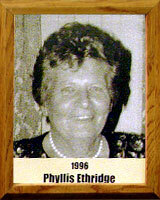 Phyllis is an original (1978) inductee into the Southern Arizona Softball Hall of Fame.